After sleeping in a bit, we had breakfast and packed up the menagerie - then were on the road again just after 9am. The distance from Forest Hill to Melbourne is about 450km, so it was another long drive but we had most of the day to do it in - and weren't nearly so tired starting out. 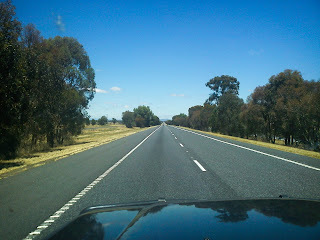 We probably did more than 450km as we called in to visit family on the outskirts of Melbourne when we arrived in the early evening. We were made very welcome as there was a roast dinner waiting for us. We spent several hours chatting, which meant we were driving through the city in the dark and arrived at our apartment about 9:40pm or similar, to unpack and start settling into what would be our temporary home for the next few months.